All the templates in this collection can be downloaded from Envato Elements for a single price. All you have to do is buy a subscription and you’ll be able to download all these templates and 490,000 more design elements without having to pay for each item. This elegant and modern trifold brochure template is perfect for designing a professional brochure for a corporate or small business. The template comes in 2 different color schemes and in A4 size. Another modern brochure template featuring a stylish design most suitable for corporate businesses, startups, and agencies. The template comes in A4 and US Letter sizes. You’ll also be able to customize it using InDesign and Photoshop as well. This colorful trifold brochure template comes in a square-shaped layout in 20cm x 20cm size. It can be easily customized to change colors, text, backgrounds, and more. The template is compatible with InDesign CS4 and higher. The minimal and clean design used in this brochure template makes it the perfect choice for designing a creative brochure for agencies and startups. The template is available in A4 and US Letter sizes. A modern trifold brochure template featuring a highly visual design. The template can be easily customized to change colors and the images to your preference. It comes in A4 size. This clean and simple trifold brochure is most suitable for making brochures for creative agencies and professionals. The template includes free fonts and drag and drop image placeholders for easier editing. If you’re working on a brochure design for a feminine brand, this template will come in handy. It features a beautiful design made specifically for promoting feminine products and businesses. This elegant brochure template comes in both Word and InDesign file formats. It also features a square-shaped design and it’s ideal for promoting photography, portfolio, and fashion designs as well. This brochure template features a simple and minimalist design you can use to craft brochures for many different types of businesses. The template is available in A4 and US Letter sizes. Another square-shaped trifold brochure template featuring a colorful design. This template is also easily customizable and it comes in both Word and InDesign formats. It’s available in 20cm x 20cm size. Malina is a modern brochure template that comes with a design for highlighting businesses, products, and services with large images. It’s best for promoting fashion, clothing, food, and other product-related brands and businesses. This template comes with 20 seamless patterns as a bonus for customizing the design of the template. This tri-fold brochure template features a clean and a professional design that’s perfect for presenting a brand or a business related to advertising or marketing. The template is available in US letter size and it can be easily customized using InDesign CS4 or better. A brochure template designed specifically for corporate businesses and brands. This tri-fold brochure comes with a modern design optimized for printing and it’s available in US letter size. The template can be easily customized to your preference as well. This is a multipurpose tri-fold brochure template that can be used to design a leaflet for many different types of businesses, including corporate, agency, creative brands, and more. The template is available in both A4 and US letter sizes and you can customize it using either MS Word or Illustrator as well. Prosto tri-fold brochure template comes with a unique design featuring a square shape. The template includes 2 formats that support both InDesign CS4 and CC. All the images and backgrounds used in this template comes in separate layers so you can easily edit and replace them with a few clicks. With a clean black and white design, this minimal tri-fold template allows you to showcase your products and business in a modern way. It comes in both A4 and US Letter sizes. If you don’t like the B&W design, you can easily change its colors as well. Another modern tri-fold brochure template that can be used to design brochures for many types of businesses and companies. Thie template comes in both MS Word and InDesign formats. You can edit its colors, font, and objects to your preference. This brochure template is designed specifically for businesses and companies that provide services. It includes several sections for clearly describing your services, mission, and solutions to your customers. The template is available in A4 and US Letter sizes. If you’re looking for a professional brochure design with a larger size, this is the template you need. This tri-fold brochure template comes with a large A4x3 size and a design that’s best for marketing and advertising related brands and businesses. A yet another brochure template with a square design. This template features a stylishly modern design that’s ideal for designing a leaflet for a fashion or clothing related business. It also includes free fonts and comes in a layered file and ready-to-print format. Want to win your customers with a unique case study brochure? Then this tri-fold template will help you get the job done. This template is designed specifically for showcasing different types of case studies and projects. You can easily edit this template in InDesign or Word to change its colors, text, and objects as well. This tri-fold brochure template comes with a minimal design that makes it perfect for food, baking, and Christmas-themed businesses and product promotions. The template is available in A4 size and you can customize it using InDesign CS4 or above. A creative brochure template for creative and corporate businesses, this template features a minimal and a clean design for easily showcasing your services and products. It’s available in A4 size and you can customize it using Word or InDesign as well. A brochure template with a clean layout and a stunning graphic design. This template features lots of icons and graphics that make it more attractive than most other brochure templates. You can easily customize this template, change colors, and formatting as well. This tri-fold brochures pack includes 3 different templates, which you can use to design leaflets for corporate, marketing, retail, and many other types of businesses and brands. All of the templates come in InDesign, PSD, and Illustrator file formats, allowing you to edit them using your favorite app. Acro is a professionally crafted tri-fold brochure that comes with a creative design. The template features connected color swatches that allow you change the color schemes with just one-click. This brochure template is best for designing a leaflet for a personal brand or a business. It comes with a content-focused design, allowing you to describe your services and solutions in detail. A brochure template designed specifically for fashion and clothing brands. This template comes in both A4 and US Letter sizes. You can edit it using both InDesign CS4 and CC versions as well. This brochure template comes with a retro-themed color design that makes it ideal for architecture, advertising, and creative agency businesses. The template comes in a fully-layered file for easy customization. Showcase your business, features, services, and products in more detail using this tri-fold brochure template. It comes in A4 size. The template is fully editable and supports InDesign CS4 or better. This brochure template is designed for crafting professional annual reports. It’s suitable for many types of businesses, including marketing, social media, branding, corporate, and more. The template is available in US Letter size. A highly minimalist brochure template for interior design businesses. 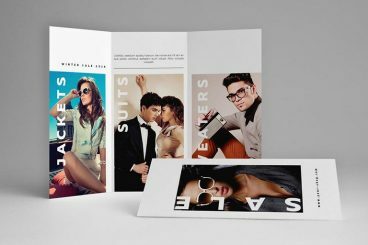 You can use this square-shaped tri-fold brochure template to attract more customers by beautifully showcasing your designs and products with lots of pictures. This is a bundle of printables. It includes a tri-fold brochure template, 4 pages of bifold brochures, a flyer template, and a business card. You can customize the files using InDesign, Photoshop, or Illustrator as well. If you’re working on a branding design in general, make sure you check out our collection of modern stationery templates!